Many of us say goodbye to our pets when we leave our homes to go to work in the morning. I sometimes even explain to my fuzzy felines that I need to earn a paycheck so I can keep their bellies full and a roof on our heads. They still strike me with a guilty glance as I grab my car keys. But not like many others, I get to say “good morning” to many cuddly creatures when I get to work here at Animal Friends. I walk past the cat condos when I arrive at 9 am. The lights are still dim, and the cats haven’t had their breakfast yet. Many are still enjoying a morning siesta, or maybe still asleep from the night before. But we do have a few early risers who regularly beam with bright eyes at this early hour. They scan the world outside their condos for life, love, affection and of course, food. So for almost a year now I've been paying a morning visit to a few early risers--a happy prelude as I head to my office. But sometimes a visit can turn into a bittersweet moment. This morning Wei was gone. 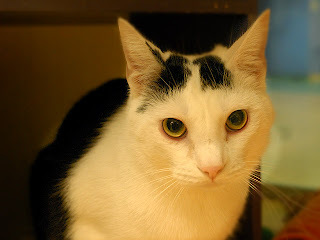 He’s a gorgeous black and white cat with pink ears and extremely expressive yellow/green eyes. I’ve been greeting him since he was a pint-sized, extremely shy kitty who was rescued from a hoarding situation. I watched him grow into a playful, robust cat full of love. I missed his round, inquisitive eyes this morning with a tiny touch of sadness. But I’m overwhelmed with joy that he found his forever home last night with an extremely lucky family. And it’s with those same feelings that I’m looking forward to not saying “Good Morning” to Woofer and Porsche, my current morning bright eyes. And if Wei’s parents are reading this, tell him Jeff said hello.